Do you love buffalo sauce? This Low Carb Keto Buffalo Chicken Casserole might just hit the spot! All of the 5 Dinners 1 Hour buffalo recipes are always a hit with our Facebook community group. 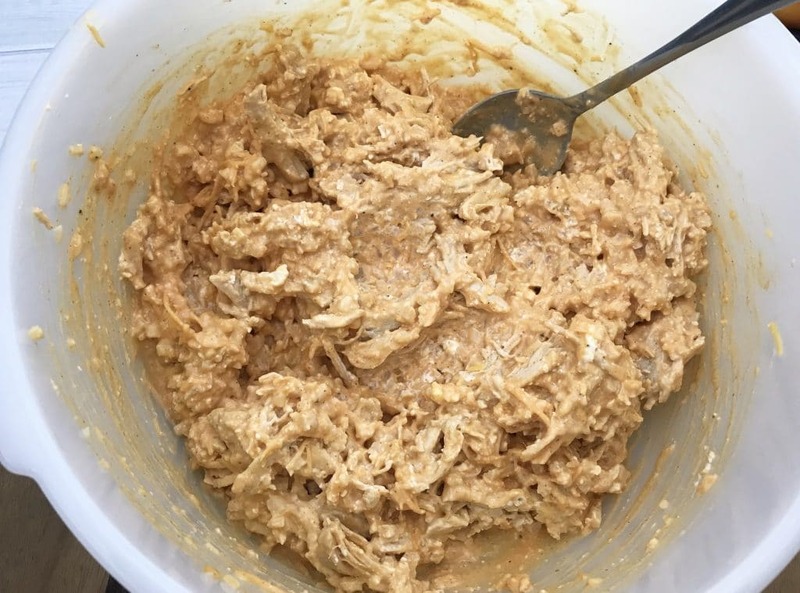 If you are on a keto diet, but have been shying away from buffalo sauce because of added sugar, it is really quick and easy to make your own buffalo sauce. 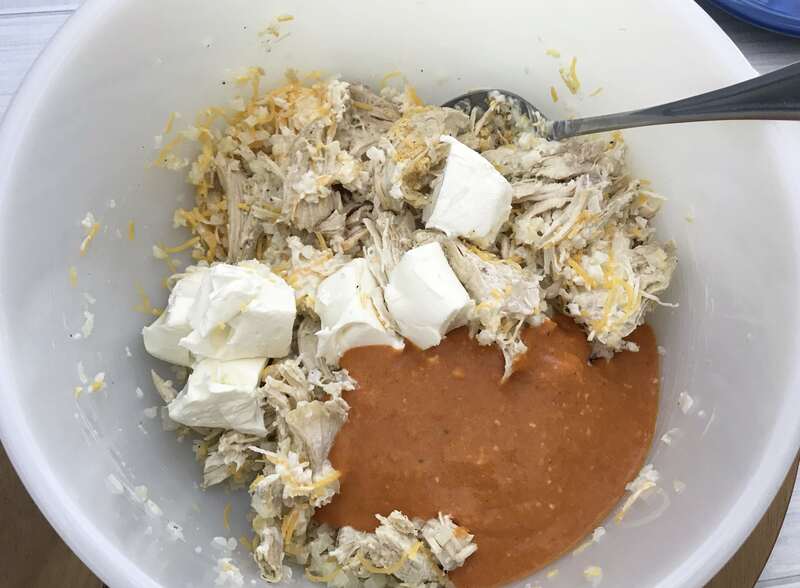 The Low Carb Keto Buffalo Chicken Casserole recipe below includes instructions for making your own sauce. Cook the frozen riced cauliflower according to package directions. Riced cauliflower is a great low carb substitute for regular rice (and mashed potatoes). In a large bowl, combine the cooked riced cauliflower with the chicken, softened cream cheese, cheddar cheese, and mayonnaise. Add the Italian seasoning, garlic powder, and salt and pepper to the bowl. Now comes the buffalo sauce! You can either use a keto-friendly store bought sauce (check for no added sugars), or you can make your own buffalo sauce. To make your own, combine hot sauce, melted butter, worcestershire, and vinegar (see the recipe at the bottom of this post for measurements). 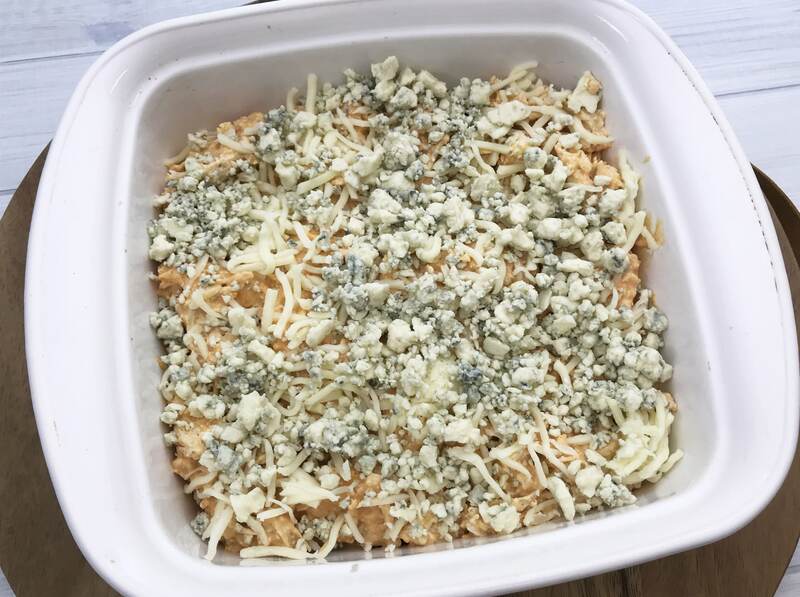 Next, pour the mixture into a greased baking pan and top with shredded mozzarella cheese and bleu cheese crumbles. Finally, pop it in the oven and bake for 20 to 25 minutes, or until bubbly and heated through. 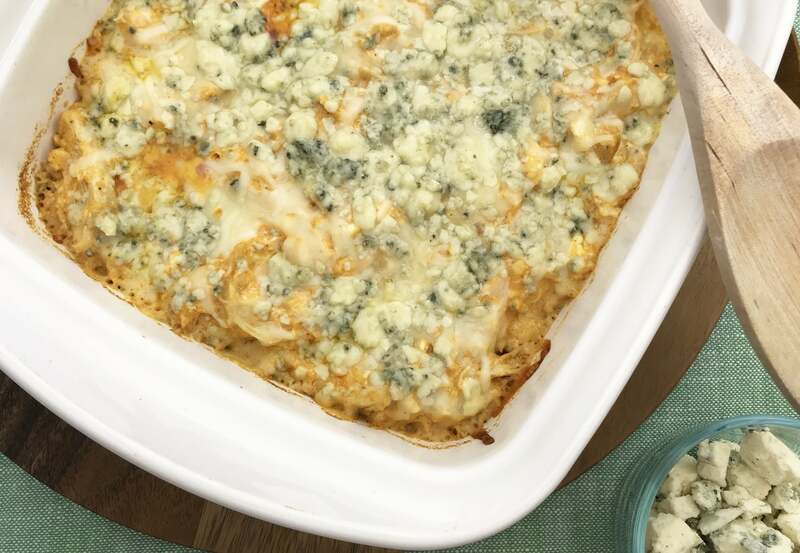 Serve up the Keto Buffalo Chicken Casserole with a side salad! 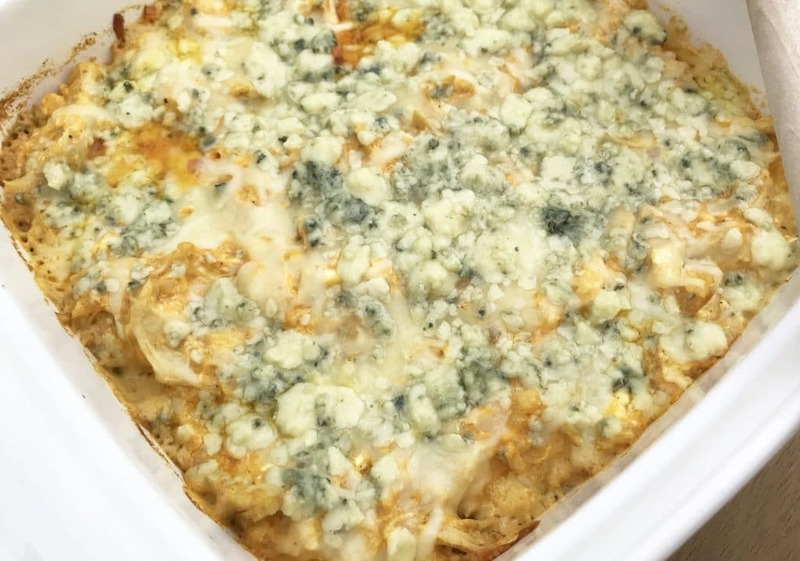 Check out the printable Low Carb Keto Buffalo Chicken Casserole recipe below! Also, be sure to grab a 5 Dinners 1 Hour sample menu here (there is a yummy buffalo sliders recipe you don’t want to miss out on)! Cook the frozen riced cauliflower according to the package directions. 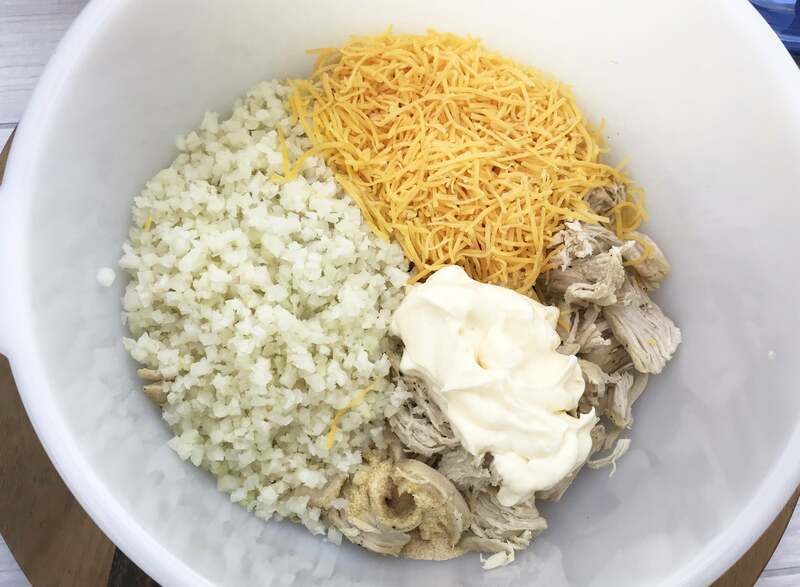 Combine the cooked riced cauliflower, chicken, softened cream cheese, 1 cup of shredded cheddar cheese, 1/2 cup of mayo, Italian seasoning, garlic powder and salt & pepper. Pour the buffalo sauce in and stir to combine. Pour the mixture into a baking dish and top with the 1/2 cup of shredded mozzarella cheese and crumbled blue cheese. Bake for 20-25 or until heated through.